Sanyal when arrested in December 2005, said that peace talks with the government was near-impossible. Narayan Sanyal, described by those familiar with his work as the “tallest Maoist leader” in the phase succeeding the Naxalbari agitation, was released on bail from the Hazaribagh jail on Thursday after being jailed for about nine years. Sanyal (78) who was a Politburo member when arrested in December 2005, said that peace talks with the government was near-impossible, due to the nature of the government at the centre. “Now they will come to the states, too,” he said, referring to the BJP’s aggressive attempts at running state governments. Sanyal, a founder member, was the general secretary of the CPI-ML (Party Unity) when it merged with the CPI-ML (People’s War) in 1998. 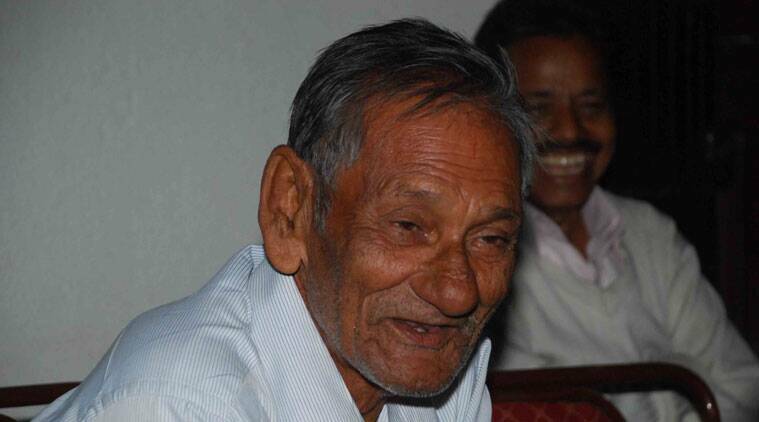 Muppala Laxmana Rao, then-GS of the PW, came to lead the new party and is now the GS of CPI-Maoist. Sanyal, who never married, said trust would be a major barrier if Maoists were to talk to the government again. “Azad lost his life to the peace talks,” he said, referring to the death of Politburo member Cherukuri Rajkumar, who was killed in an encounter. When asked whether he still believed in armed action, Sanyal chuckled: “Kahe phasaarahahe…. If I tell you anything now, the police will pick me up tomorrow.” The two Special Branch personnel who sat amongst journalists, taking notes, chuckled too. However, he did not hesitate to hint that the Maoist party needs to re-think its strategy when it comes to land and mass movements. “Land to the tiller is no longer the only problem of the peasantry…. There is also a development question,” Sanyal said. He had been jailed at the same Hazaribagh jail at the time of Emergency, at a time when Marxist Leninist parties were grappling with the idea of how to organise the masses. “We are still thinking of that question,” he admitted. He referred to a letter that was seized from Dr. Binayak Sen, which eventually led to both of them being sentenced to life imprisonment. “I had written on the problem of organising the masses in it,” said Sanyal. Sanyal, who was active in the Palamu region of Jharkhand, is remembered by his comrades for bringing together various M-L splinter groups into his PU organisation. He however rejected the idea of Jharkhand’s various splinter groups coming together. “They have nothing to do with the movement. They are just gangs… You have someone like Yogendra Saw forming two gangs using the Maoist tag,” he said. Saw, a former Congress minister, is currently in Hazaribagh jail after after being arrested for his role in the founding of two criminal gangs. He said he was saddened to see his former proteges abandon the Maoist movement. “I knew Kameshwar Baitha and Jugalpal when they were children. I brought them into the movement. I was very disappointed by what they did,” Sanyal said, talking about Baitha, a former MP and Jugalpal, who joined the AJSU Party.